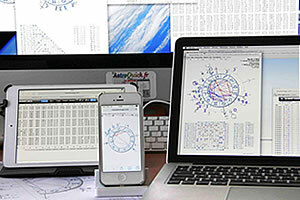 Mac OS X, PC Windows 8, iPhone, iPad, Linux, Android, iOS compatible. ANNUAL LICENSES 4 times cheaper than a classic software and its updates ! Editions: PNG, JPG pictures and PDF graphics (high resolution). Recordable and unlimited multi-criteria preferences. Multi-devices iPad Mac PC iPhone etc. Loyalty Bonus: one or more free month when renewing your annual license! Trials licenses with refunds upon first order of 12 months or more license. NB: Price drop guarantee ! No obligation to subscription or debit: you buy your license when you want and at anytime you can enjoy any promotions to extend it. Your data is kept for at least two years after the license expires. Upon renewal, you will automatically receive a loyalty bonus of one free month for each year of seniority. * More discount as soon as you renew your first license. You get a free month or more when renewing your annual license at least 30 days before its expiration. You can also enjoy occasional promotions to extend your license at the best price. Your license can be extended at any time, each renewal automatically extends its duration and allows you to cumulate years of seniority. ** Your annual license is automatically extended by 30 days per year of seniority. 1 month free at the first renewal, 2 months free at the second, 3 months free on the third, and so on. To take advantage of this offer, you must renew your license at least 30 days before it expires. Example of a yearly subscription that starts on January the 1st, 2010: by renewing your subscription at least one month prior expiration (i.e before December the 1st, 2010), you will automatically get a free month. Its validity will therefore be extended by 12+1 months, i.e until February the 1st, 2012. And so on...by renewing your third subscription before January the 1st, 2012, you will get two months for free and the subscription expiration will be then on April the 1st, 2013. After a 5-year subscription, you will get a total of 6+1 free months per subscription. After 11 years, your license is extended for another 12 months free. NB: Seniority bonuses apply to license renewals of 12 months or more. The years of seniority are not carried over from one version to another, such as when passing the ECO of the PERSO version. If the license is not renewed at least 30 days before it's expiration, previous seniority bonuses are lost. *** The licenses of more than one year are not divisible nor refundable, they remain redeemable only to a higher version. ™ All trademarks are registered trademarks.